Whether you live in Fremont or in the surrounding area, now is the time and this is the place to let your imagination blossom. We find ourselves with a significant opportunity to transform the blank canvas of downtown Fremont into something beautiful and bold, community-driven and creatively engaging. We know some may not take this call seriously, but for those reading, we really mean it! Your feedback and input is read by everyone on our team. Your ideas power what we do. Share your thoughts! "I've been to Town Fair Plaza! I'd love to share my thoughts." So you've visited Town Fair Plaza and you have some thoughts and feedback for us. Great! Feel free to share here. Our first Second Sunday Swap Meet is February 9th 2019 at Town Fair Plaza. How would you like to use the space for that day? December 15th 2018 we will have our first Weird Science Fair at Town Fair Plaza! It will be a fair featuring interactive exhibits showcasing STEM oriented fields. It is a free, family friendly event! Click here to be part of our event! "I live in Fremont or spend a lot of time in Fremont." 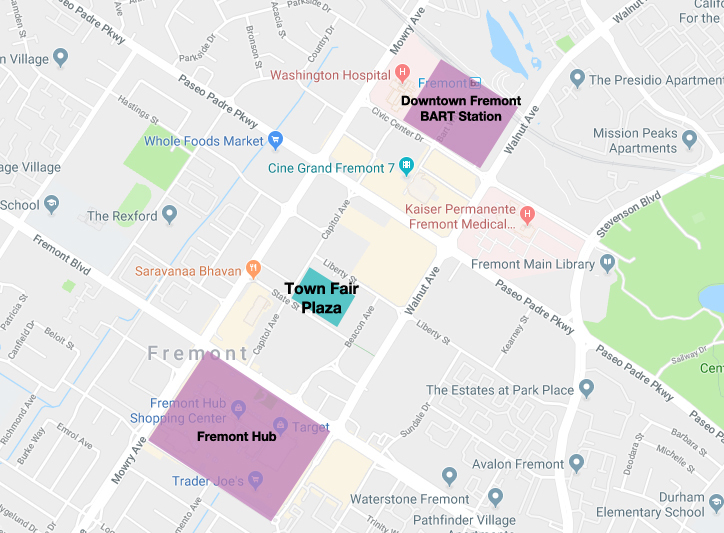 What's going to make Town Fair Plaza unequivocally and authentically Fremont is the influence and impact of the Fremont people and the Fremont community. What idea will make Fremont more interesting, more entertaining, more wonderful, more important? You may have the next great idea for making Fremont the best city in the Bay. "I am a maker. I am a manufacturer. I am a creative small business." Parts of Town Fair Plaza are being specifically designed to positively impact Fremont's maker and creative culture. We have some tremendous ideas for what we can do to achieve this but we want to know what you want. We have the space. We are installing the infrastructure. How can this space make your life as a maker or a creative small business better? "I am a musician. I am a performer. I am an entertainer." We have the space. We will have a stage. We have the eyes and ears of Fremont on us. Now, we're looking for musicians, performers and entertainers to become part of our programming calendar for 2018. Start the conversation. Let us know who you are and what you'd like to do. Great communities have great artists but just as importantly, great communities have ways to feature these great artists. Great art always elevates a space and a community to something unique and indelibly its own. It's worth repeating: We have the space to help Fremont artists bring their art to the forefront of the Fremont culture. Let's do something great. Let's do something big. What's up? "I do events. I have a great idea for an event. I want to bring my community to Town Fair Plaza." Just because Town Fair Plaza will frequently feature its own events does not mean that we aren't open to outside events coming to Town Fair Plaza. In fact, we'd love for Town Fair Plaza to be the first space people think of whenever a wild, ambitious, bold idea for an event. You have an idea. We have space. Let's connect! "I'm interested in bringing new activities and programming to Town Fair Plaza." Like with events, just because Town Fair Plaza will frequently feature its own activities and programming does not mean that we aren't open to outside activities and programming coming to Town Fair Plaza. In fact, we'd love for Town Fair Plaza to be the first space people think of whenever a wild, ambitious, bold idea for activities and programming. We'd love to discuss your ideas for new activities and programming!